Code of Conduct – Les Bébés Amphibies Int. We suggest that parents arrive “ready to swim” so that they can concentrate on preparing their child for the session. Please keep your child close to you and under control and do not allow them to run on the hotel premises so as not to disturb other guests and for the safety of your child. We ask you to also be aware that the floors around the pool and in the changing areas are often wet and slippery, so please do not allow your children to run around. Ensure you hold their hand when walking. Les Bébés Amphibies Int. asks and expects every parent to be polite and courteous towards all hotel staff and guests at all times. PLEASE remember that your contract is with us and not with the hotel, so if you have any issues or concerns this must to be made to Les Bébés Amphibies Int. and not to the hotel staff, and we will deal with your complaint. Any parent that is found to be rude or abusive toward any member of the hotel staff or guests, or disturbing staff with any complaints, could find their contract with us being terminated and the fees will not be refunded. As changing facilities are limited in terms of space, we request that you do not bring prams, pushchairs or buggies inside pool and changing area. At the end of the session, we advise that you keep your child wrapped in a towel and get changed first, as this is often quicker and “dryer” for both parent and child. We also request that you use the changing facilities as efficiently as possible, so that parents and children arriving for the next session can use them. We recommend that you bring the following items with you to each session: Towels for parent and child; swim nappies, neoprene leak proof nappy and swim costume. Please note: that all children unto the age of 3 MUST wear a swim nappy with neoprene cover nappy and over 3 if not 100% toilet trained. If your child is found to be urinating in the pool or on the poolside you will be asked to leave the pool immediately and their lesson will not be replaced, they will also need to wear a swim nappy for all future lessons. We kindly request that you take soiled nappies home with you for disposal to avoid unpleasant smells in the changing room, any unsoiled wet nappies may be put in the bin marked nappies supplied by the hotel but not in the waste paper basket. PLEASE NOTE DO NOT FEED YOUR CHILD WITHIN 2 HOURS OF THE LESSON and give them easily digested food. (no solid fruit on swim day). At the end of each session your child may need refreshment; therefore, we suggest that you bring a suitable drink or yoghurt with you. If you purchase food or drink from the Hotel Café you will be allowed to feed your child in the lounge bar area. All Bébés Amphibies students and families are entitled to 20% discount on food and drink in the bar area. Please ask when ordering. For every adult meal purchased 1 child eats free. For details please ask at he bar. We recommend you to visit the government website on vaccinations www.immunisations.gov.org or consult your health care practitioner. The hotel offer our parents a concessionary parking rate of £1.00 for the first car any subsequent cars will be charged at the full hourly rate. Please hand in your parking ticket at the reception when leaving the hotel and they will give you a pass. On occasions the hotel car park may be full in this instance you must use the overspill car parking just 50 metres down the road or the NCP Carpark at approximately 100 meters down the road. This doesn’t belong to the hotel and normal charges may apply. Please be mindful that our lessons are in a private pool within a hotel and we only hire the pool and changing facility. Under the Terms & Conditions within our contract with the hotel; only children participating in the lessons and their guardian have access and permission to use the pool, Jacuzzi and changing facility within the spa area. Under no circumstances must any other members of your family use any of the spa facilities. One adult per child is allowed down to the pool. It is also strictly forbidden for you to enter the gym facility at any time. Visitors must wait in the lounge area at all times. Please remember that this is a hotel and your children must be kept under parental control at all times. We would ask that you are respectful of the hotel property and the guests at all times. Please do not allow you or your children to jump into the pool from the Jacuzzi or swim in the area reserved for hotel residents. Thank you for your understanding and we hope you enjoy your classes with us, using the sessions to create a special bond between mother/father and child. Your child will be working hard during their lesson learning valuable lifesaving skills and after the sessions will appreciate cuddle time. Don’t forget to praise and encourage them by telling them how pleased and proud you are of their efforts. Please remember that when you take your child to the pool outside of lessons this is “pleasure time” so please DO NOT try to replicate or repeat any of the exercises taught in lessons. All our instructors have been highly trained to teach this method and to try this on your own may be harmful to your child if not carried out correctly. 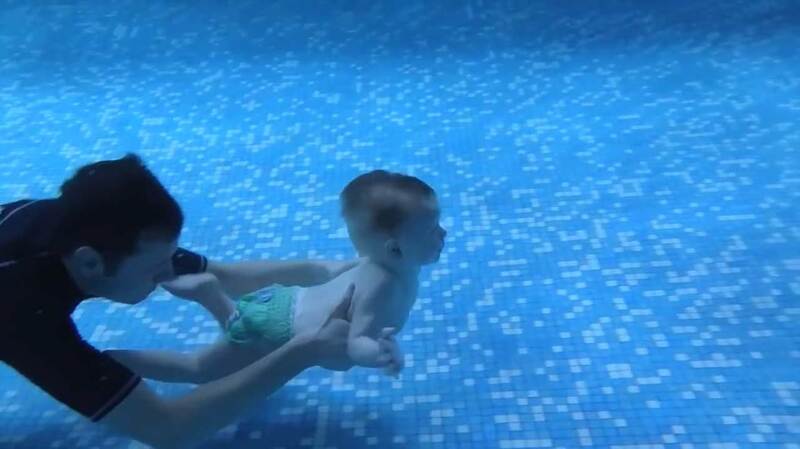 Once your course commences it is imperative that you DO NOT use any form of buoyancy aids whatsoever as this puts them in a vertical position in the water and we are training them to be in a horizontal position so this will confusing for the child and you will be wasting your money. When you are in and around water with your child please remember constant supervision is imperative at all times. Les Bébés Amphibies can only be responsible for students during their swimming lessons and parents and/or guardians are responsible at all other times. There will always be a parent or guardian in the water with every child. This is very important so please ensure that you or your appointed guardian is present in the water with your child and if your child needs the toilet you or the appointed guardian MUST accompany them. If you have to miss a lesson we understand that having to pay for one or two missed lessons during your term can be a little irritating, but our costs remain the same whether everyone is present or not. Therefore, Bébés Amphibies is under no obligation to refund, replace or transfer your money if you can’t attend part, or all, of the course. The taking of photographs by parents or spectators in any area is strictly forbidden from either by the poolside or through the windows. This is due to Child Protection and Privacy laws. Bébés Amphibies cannot be held liable for the actions of third parties, and therefore excludes to the fullest extent possible by law any liability arising from a breach of this. No electronic equipment, including cameras, mobile phones or tablets is allowed at the poolside. You MUST leave your all your devises either in your bag or pocket. Lessons will be suspended if this rule is not adhered to. Bébés Amphibies reserves the right to use our photographs & videos for publicity purposes. By allowing us to take photos or video, you are consenting for us to use these images for marketing and publicity purposes.